Happy Healthy Holidays with Sunrider! We want to wish you and your family Happy Healthy Holiday’s with Sunrider 🙂 The coming month will be filled with wonderful fun times with friends and family! Lots of people are going to be very busy traveling to family and friends, planning parties, cooking fantastic tasting meals, and shopping for fun and lovely gifts to give to our friends and family on the upcoming holidays. It is a time full of anticipation, fun and some stress…. We all know that the holidays are fantastic fun, but also with that fun, sometimes brings a little “stress”. Most Americans can identify with some of the issues above. 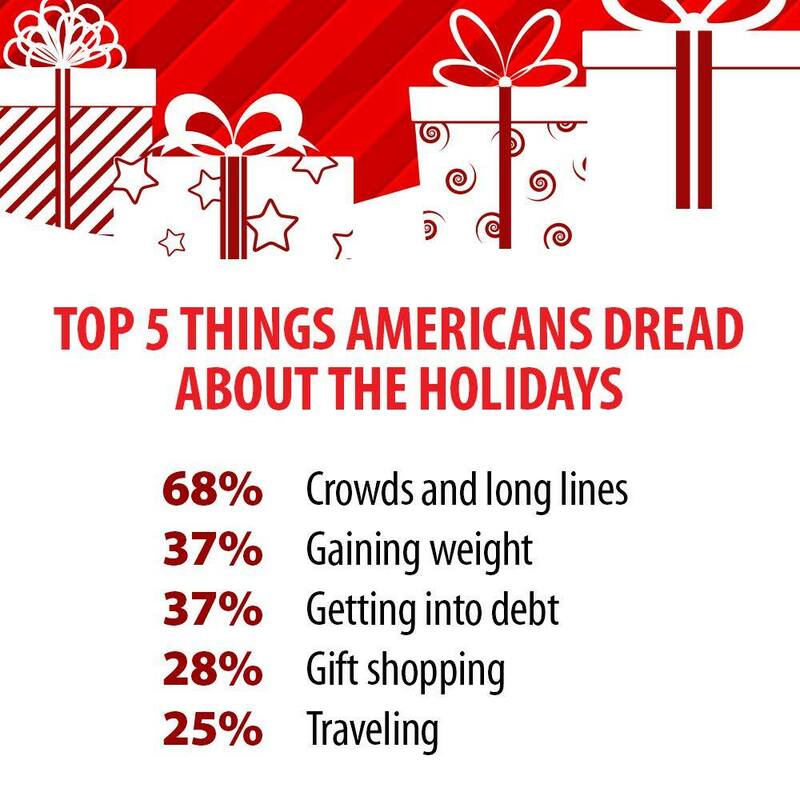 Most Americans feel the stress of Crowds and Long lines, Gaining weight, Getting into debit, Gift shopping and Traveling are just some of the stress issues that most of us have during the holidays. To assist with elevating some of these issues here are some suggestions. 37% of Americans worry about gaining unwanted weight. That is a lot of people! Millions and Millions of people are worried about gaining weight during the next month! A great way to combat that weight gain is to eat during the coming weeks. Sounds funny right? But it is true. Studies show that when we deprive ourselves of foods and nutrients , we overeat when the food is finally in front of us. So please eat in moderation in the coming weeks. I find that when I eat every three to four hours, I end up eating smaller and healthier meals. In the end I eat better and less bad calories. Two snacks that I enjoy are the Sunrider SunBars and the VitaShake. I enjoy eating both about an hour before a heavy meal, such as a large holiday lunch or holiday dinner. 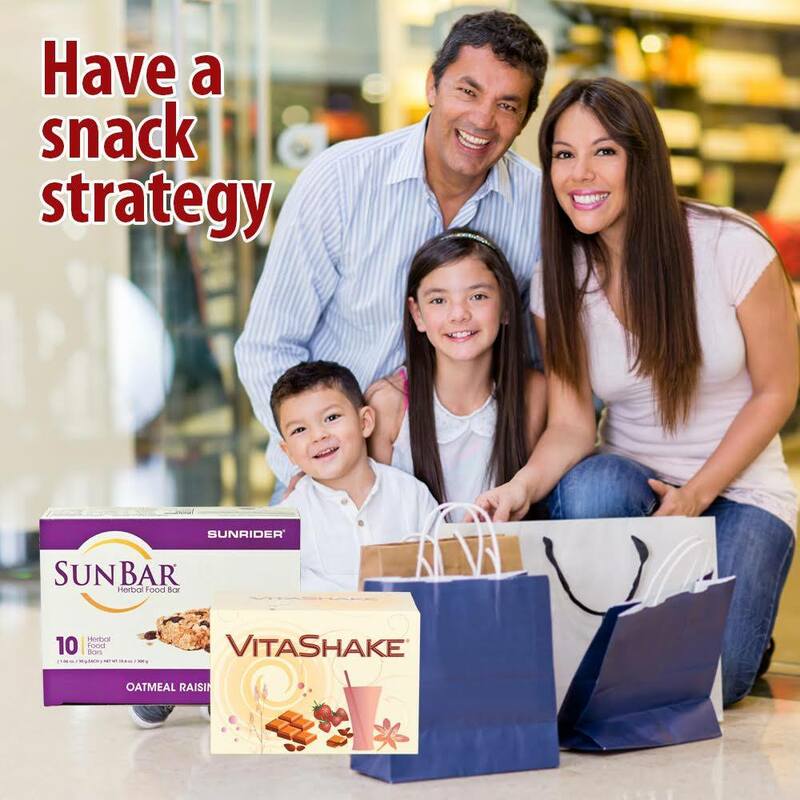 Have a snack strategy : Sunrider Unbars, Sunrider VitaShake are great snack foods, low in calories and tastes great! 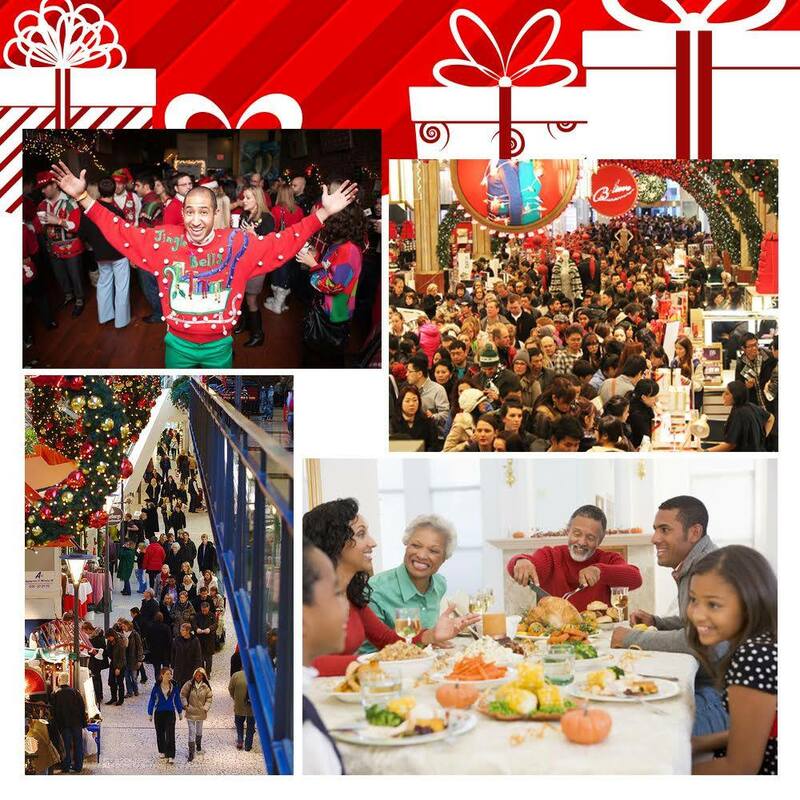 68% Of Americans Dread crowds and long lines….Shopping is up at the top as one of the most stressful issues of the holidays. Shopping at Sunrider online at Wholesale is easy, fun, no lines, and healthy! I personally love the fact that I do not have to deal with parking, lines, and having to chose what to buy for who and where to shop. I love the fact that I can order Sunrider products on line and have everything shipped directly to me or to the home of a friend of family. 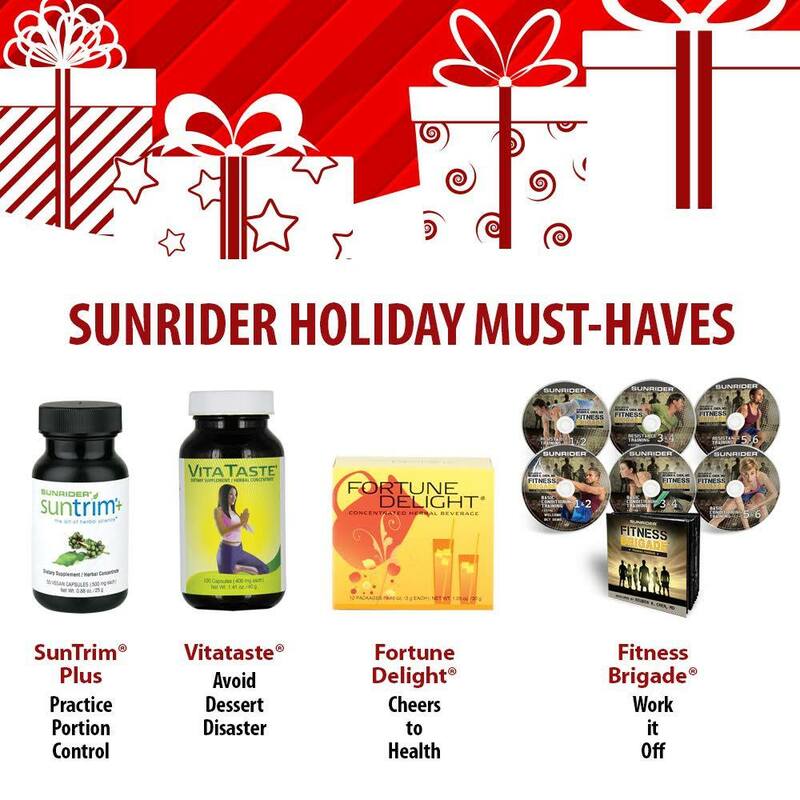 The SunFit Program of the Sunrider Fortune Delight, Sunrider SunBar, SunTrim Plus, Sunrider VitaShake and Sunrider SunnyDew is a great pack for getting a healthy jump start on the healthy weight control during the holidays. In addition, Sunrider is having a FANTASTIC Gift set sale! Now for the next month, when someone orders a Sunrider SunFit Holiday Gift Set you get a Sunrider Fitness Brigade Workout home System! 37% of Americans worry about gaining unwanted weight during the holidays! One way to combat the weight gain, besides eating smaller portions, is to do a few easy Sunrider Fitness Brigade workouts, like the Jumping Squats, Burpees, Mountain Climbers each day. Even if you do them slowly like I do, you will build muscle, lose fat, and feel great. I do one minute a day in the morning, afternoon and evening. Over time if feel i am getting stronger, losing weight, and feel like I can move better. Sometimes we all need a “little” Help with our “food” control…. I for one eat “with my eyes”. I love ALL the wonderful holiday foods…. So I have turned to Some of the Sunrider Products to assist me with my over indulging …. A Sunrider Product that has “saved” me is the Sunrider SunTrim Plus. I have “lost” 8 pounds in ten days using the Sunrider SunTrim Plus! Anther Sunrider Product that I love is the Sunrider VitaTaste! The Sunrider VitaTaste helps me enjoy the deserts without gaining the unwanted weight! The Sunrider Fortune Delight Drinks is great for losing fat and tastes great, I like the Peach and Lemon Fortune Delight flavors. Here with the Sunrider Business Opportunity one can earn a recurring income stream of anywhere from $1,650 to over $10,000, $20,000 or more a month! 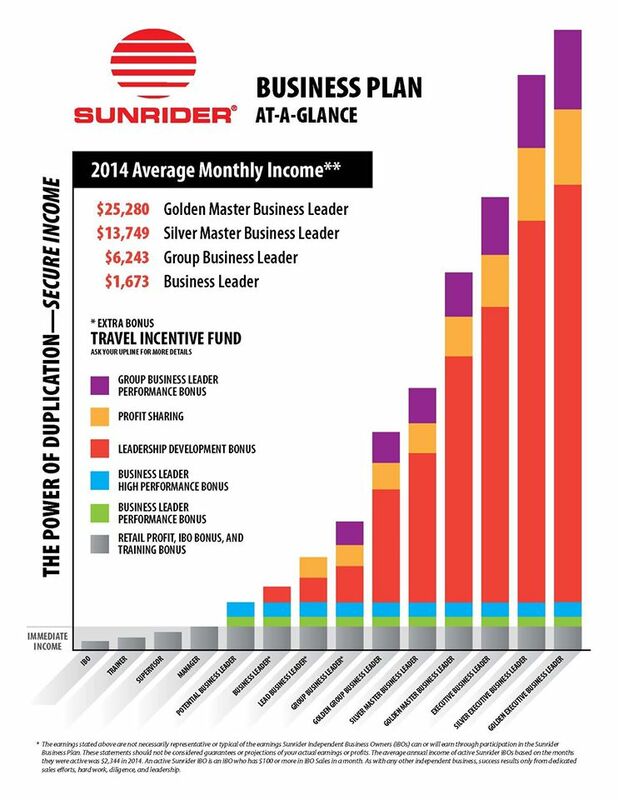 Sunrider, unlike “other” opportunities, we have and show you the real income you can make! Our family has been active with the Sunrider business since 1994 and we have made millions, by enjoying the healthy Sunrider products and participating in the business opportunity. In the beginning it was never my intention to make that kind of money. But the business and Sunrider grew! I just wanted to make an extra $1,000,$2,000 or $3,000 a month…. Please feel free to contact me at anytime if you would like to learn more about the business Possibilities. We at www.SunHealthAZ.com want to wish you and yours a Healthy Happy Sunrider Holiday!